Season the beef generously with salt on both sides. Add water to a pot and add the beef. Bring to a simmer and boil for approx. 10 min. while you prep the other ingredients. Peel one of the onions. Dice carrots and add to a bowl. 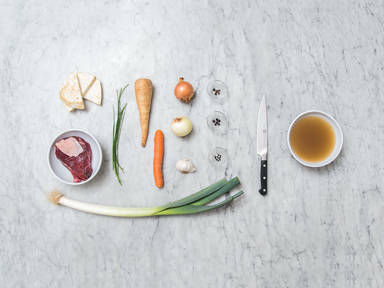 Dice celery root, parsnips, leeks, and peeled onion and add to the bowl with the carrots. Cut the unpeeled onion in half, making sure the root ends stay intact. Peel the garlic and finely chop. Use a spoon and a bowl to skim off any foam from the pot, and discard. Put the allspice, peppercorns, and juniper berries in a tea egg and add to the pot. Add all of the vegetables. The water should cover the vegetables, so add more if needed. Cover and simmer for approx. 2 hrs. Remove pot from heat and serve stock immediately or freeze for later use. Enjoy!